We are looking to hire an experienced, versatile WordPress developer to lead development of a popular WordPress mobile theme plugin. This is a mature product used by many thousands of sites. Nevertheless, like any product, it requires continuing development to address security issues, bugs, and continue releasing features that address the shifting needs of the WordPress community. If you're an experienced WordPress developer, this position may seem a little different. You won't be answering to clients, and you won't be guessing at the wishes of non-technical managers. Instead, you'll work alongside a remote team of experienced startup founders to create and execute a long-term product development strategy. We have the first 6 months scoped out already, but after that, you will be leading product development and acting as the technical lead and, indeed, the product ambassador! This is a flexible part-time position; that is, we expect that the person who fills it is ambitious enough to be working on another projects alongside it. Experience with Git fundamentals (checking out, branching, committing, pushing, merging). Familiarity with continuous integration / automated deployment strategies. Excellent communication skills. Along with communicating with our team, you need to be able to communicate new product developments and engage with customers on Twitter, Facebook, and our blog. Excellent project management skills. Able to scope out new features and create a roadmap for future development. Ambition — this role grows with the product! We invest in successful, growing companies and make smart investments to catalyze their long-term growth. Be part of a rapidly-growing business. Learn from a team of experienced startup founders. 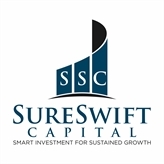 Want to get notified about new jobs at SureSwift Capital?